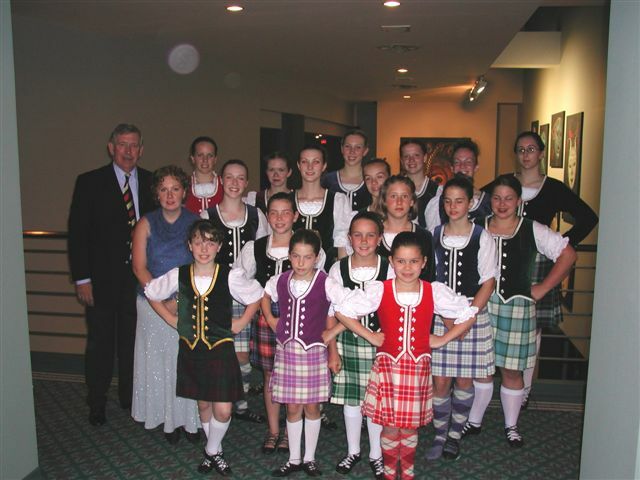 SIMPLY THE BEST, 18 Highland dancers of the Sauve School of Dance, Belle River, Ontario, Canada rocked the Rangers Football Club and their supporters at their "world- wide annual convention" held at the Cleary International Convention Centre. The near 1000 in the crowd had come to honour the "Barcelona 1972 Dream Team". Glasgow Rangers European Cup Winners, 30th Anniversary of that very special moment in footballing history. 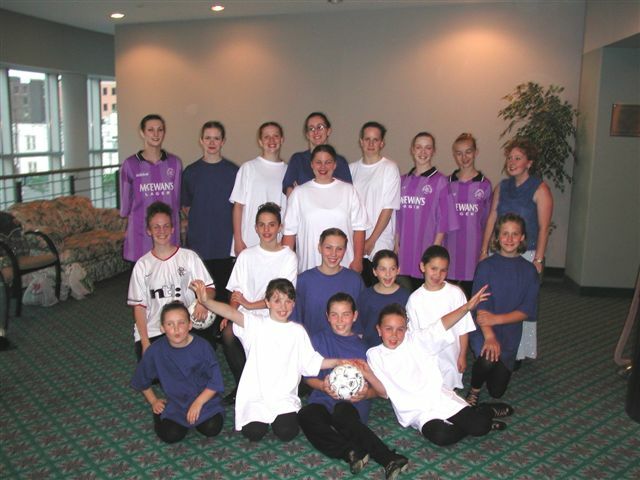 Coaches and players from the "dream team" and current players from the club. former Capt. John Greig MBE, Colin Stein, Davie Johnstone Davie Smith, Sandy Jardine Tommy McLean Tommy Craig and Andy MacDonald, Sammy Cox who played with the Rangers and Scotland with the rest of the audience leapt up from their chairs when the classic "Simply the Best" echoed around the facility. Jen Sauve, Dance Director of the studio knew that the tune was played before the Rangers games." When I timed it was over 4 minutes long but since there was already some excitement generated by using the number we felt we had to come up with some creative choreography". The number was performed by all 18 of the dancers with 4 solo spots; dancers used soccer balls, Rangers T-shirts and traditional Highland steps. Soloist were Dayna Seguin 19, (former Ontario rep who with travel to Cowal and competing in the Cowal Cup and a week later winning the New York championship as well as other prestigious championship has cause for championship celebration herself. Stephanie Tait, 18, Megan MacLennan 17, another of the studios championship winners and a gymnastics coach and 13 year old Heather Farquhar, Heather studies ballet as well as the dances of Highland and spent last summer with the Canadian National Ballet. The number Dancing Queen also performed by the 4 soloists again gave the audience reason to celebrate. Megan MacLennan did a "Flamenco Fling" with style and grace. The graceful interpretation was also apparent in the performance of Heather Farquhar in the interpretation of "Lough Erin Shore". The "Challenge Hornpipe" was performed by Ray Quinney and Natalie Dupuis, 10 year old Natalie recently earned the "most promising dancer award" The dual talents of Megan and Heather finished the evening with their trophy winning performance of "Catharsis". The Sauve Studio on making this a very special evening for all spent a great deal of time and effort. Jen reflected, " It was nice to have the opportunity to work on something other than competition dances and for all the 18 dancers to be working together. As usually lessons are separated by age and group and they usually don't see each other except at competitions, so that was special"
Emma Eldrige 8 years the best part "was dancing in front of soooo many people, Dancing is really fun". Natalie Dupuis "the best part was when we were dancing and everybody was cheering." ALL those people" a statement echoed by 11-year-old Jordan Gagnier "I have danced in front of 3 schools, but that was not close to a thousand..it was day care schools! The dancers obviously appreciated the audience as much as the audience was appreciative of their talents. Dayna Seguin (who has appeared in the column previously) "I had been told all about the Glasgow Rangers from my grandparents over the years, My grandpa who has sinced passed, would've been very proud of me. It was a proud moment for me when former Capt John Greig agreed to have his picture taken with the whole dance school, I will always remember that." 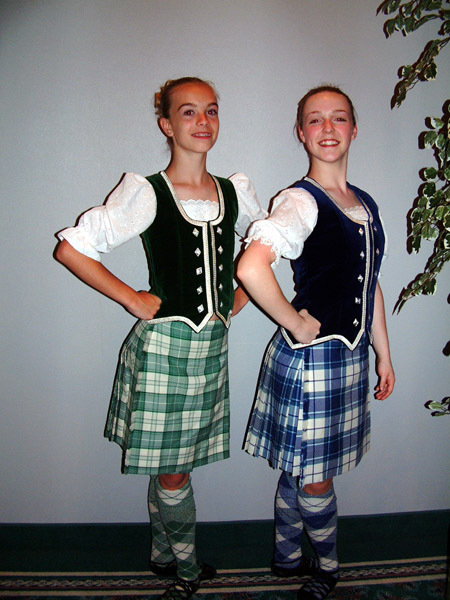 Dayna currently attends the University of Windsor and also plans on teaching the Highland dance form herself one day. Craig Smith (frm Jr. Hockey Player and winner of many cups and personal awards himself through the years) was the evenings MC for the dancing portion of the evening." I never shook so many hands in my life" a highlight was to be able to touch "the Scottish Cup". Craig who has "Rangers" memorabilia around the house since first he could remember found the evening even more special to have his sister, Jens, dancers performing her originally choreography. Highland dancers rely on the competitive circuit to demonstrate their talent and art form. Audiences usually made up of competitors, families or when performing with Celtic groups limited those "educated in the Highland arts". The Jen Sauve School was able to go beyond the norm for Highland, the dancers and audience experienced that rare animal in the Highland world "communication" on another level.